WESTBURY, NY--(Marketwired - October 08, 2015) - Spectronics Corporation manufactures state-of-the-art transilluminators built to exacting standards used for visualization of target DNAs and proteins. They work by emitting high levels of UV radiation through the viewing surface. The advanced Spectroline® Bi-O-Vision™ Series transilluminators feature two workstations, producing both 312nm ultraviolet and white light. The TD-1000R model offers fixed-intensity while the TVD-1000R model offers variable-intensity control of either UV or white light. These units are continuously adjustable from 100% down to 50%. This enables researchers to select medium wavelength ultraviolet or white light illumination to view fluorescent gels or visible blots. The UV-B (312nm) intensity of the TVD-1000R can be varied. This flexibility in irradiance control helps ensure the longest sample preparation time, while minimizing actual UV damage to the sample. 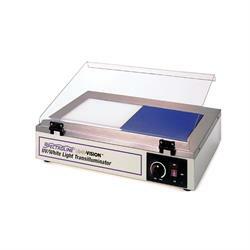 The Bi-O-Vision transilluminator has two adjacent workstations, each with a filter area of 8 x 8" (20 x 20 cm). The UV side is lit by five 8-watt UV-B tubes and delivers nanogram sensitivity for detecting ethidium bromide-stained DNA or RNA. The white light side has three 8-watt fluorescent tubes that ensure excellent illumination for viewing Coomassie blue-stained protein gels, methylene blue-stained DNA gels and autoradiograms.